We met Elizabeth at a recent BWH event and were instantly impressed by her passion and tenacity for the work she’s doing (and her killer networking skills to boot.) She’s a mental health therapist, business owner, former educator and a current candidate for Duval County School Board, District 2. When it comes to our education system and the state of mental health for our youth, she brings an overwhelming conviction, in-depth knowledge and a heart for change to the table and we look forward to her inevitable successes to come. Pease take the time to vote in your midterm elections today, and be an active part of change in your local communities. It’s imperative that we stand up for what we believe in and support those —like Elizabeth— who align with our values and are advocating for our our youth and the future that awaits them. This may be cliché, but honestly, my mom. My mom struggled throughout her childhood with self-image; she endured bullying both at home and school, yet she persisted. She eventually got married and struggled with infertility, yet she persisted. Her father, mother and my father died within a three-year span and she was left alone as a single mom to a 4-year-old, yet she persisted. In an attempt to provide a good life for me, she attended community college in the evenings while trying to be physically and emotionally present for me, yet she persisted. She has allowed me to explore myself and have my own ideas, and taught me to respect myself and others. She has always given of her time selflessly to help anyone who asked for it, setting an example of compassion and service. When something needed to be done around the house, we did it together. When she needed to stand up for herself or me, she did it. She taught me to be assertive and dauntless. Despite her struggles, she always put what was “right” first. Although there are many other incredible women around the world doing very admirable things, when I am struggling to stay focused on my goals or having a hard day, I think about my mom and her persistence and remember I am strong and capable because of her. I prefer spending time with my son, riding bikes, and going to the beach, pool and park. I have a wonderful network of friends that often join us in these activities. After the little one goes to bed, I also enjoy reading and meeting up with my girlfriends for a martini or glass of wine. Currently, I’m running for election to the Duval County School Board in District 2; I’m working full-time managing a team of community-based mental health therapists at The Child Guidance Center and partnering with multiple local and state organizations to provide mental health programs for children and families; I’m working part-time running my own mental health private practice, Foundations Therapy Jax, specializing in teens and parenting; and I am a wife and a mom to an amazing 2-year-old. What led you to pursue a career in mental health? I didn’t take my first psychology class until I was in college. The subject made so much sense to me; I remember thinking, doesn’t everyone already know this stuff? It seemed like such an intuitive subject for me—I was the kid who was psychoanalyzing my friends and their relationships with their parents and boyfriends before I knew what psychoanalysis was. I began teaching high school English after graduating from college, but decided quickly to pursue my master’s. I intended to be a school counselor, but opted to get my master’s in mental health to be able to have more options and opportunity. I did not realize at the time that there are significant barriers to becoming a school counselor as a mental health counselor. My time as a teacher was fantastic because of the relationships and mentoring I got to do with my students, so it was natural for me to move into children’s mental health after graduation. I began working in the nonprofit sector in community mental health over six years ago and have grown my specialities to include teens, parenting, maternal mental health, infant mental health and trauma-informed care. How do you prioritize and manage your workload and various responsibilities? My ability to compartmentalize my life helps. I can switch into different modes fairly easily. I’m goal-oriented and purpose-driven, so I stay focused on the task at hand and try not to get too far ahead of myself or spend time looking in the “rearview mirror.” I work to stay present with whomever is in front of me. Being community-based, I don’t have a designated office for my full-time job. My two cell phones help keep me connected to staff and clients. I use several software tools and programs to help keep me organized in my private practice, such as Google Voice, Ivy Pay, and Brighter Vision. What motivated you to run for the Duval County School Board position? I have stayed connected to the teacher-friends I made when I was a high school teacher and have several longtime friends who have also become educators. As I was talking with these teachers and the changing needs of their students and the schools—especially in the wake of multiple episodes of tragic school violence—I began thinking about how our schools really need to look at education and our children and teachers differently. My friends and I often get into philosophical conversations about child development, education and our society, and it seems clear to me that if we want to make things better for the future, we must start by educating our children and supporting their needs. The problem is that times have changed, and the old ways aren’t cutting it anymore. I’m thrilled that the need for increased focus on mental health in our schools is a conversation people are having, but I’m concerned our leaders don’t actually know what this means or how to implement it. So, I thought to myself: Why not me? If not me, then who? If not now, then when? What can we all do to help transform the conversation on mental illness? We have to stop whispering about mental health like it’s something to be ashamed of. We need to stop demonizing and criminalizing people by focusing on their “illness” and start praising people for their strength and courage to fight for their health. Twenty-five percent of children between 13 and 18 suffer from anxiety, and suicide is the second leading cause of death for teens. Unfortunately, these numbers continue to rise year after year. This isn’t weird or unusual and we have to start accepting that our young people deserve to ask for help without being judged; we have to celebrate their bravery and courage when the step up to advocate for themselves. Through my work with the Child Guidance Center and my private practice, Foundations Therapy Jax, my greatest accomplishment in public life has been touching the lives and helping to heal hundreds of children and families across the First Coast. Recent partnerships working to expand children’s mental health programs and the development of a trauma-informed early learning center with a local homeless shelter, as well as launching an evidence-based treatment program for maternal depression locally, and scaling this across the state in partnership with Florida Maternal, Infant and Early Childhood Home Visiting (MIECHV) and the Florida Healthy Start Coalition, have also been major accomplishments for me. Additionally, I’m currently working on a strategic planning committee with the Kids Hope Alliance, National League of Cities and a host of other community businesses and organizations including the mayor’s office, to identify barriers and establish goals for meeting the early-learning needs of all children across Duval, which I anticipate will be groundbreaking for our communities. My work in social services is primarily female-dominated. However, like many other fields, the executives for many agencies and organizations are male. It can be difficult to show the grit and professional tenacity required to advance in a field that generally expects people to be gentle and non-confrontational. In the nonprofit world, money can be hard to come by, so asking for raises or salaries that compensate for the work we’re doing is tough and can get extra complicated by being female. With that said, the women I work with are incredible! When you can find a group of women who seek to support and empower one another and share a common focus and a drive toward purpose, meaning and fulfillment, this is girl power at its finest. It’s through these networks of incredible women I have been inspired to advocate for children’s mental health and the health and wellbeing of families and our communities. Susan Stiffelman, Janet Lansbury, Magda Gerber. Our skills are honed over time. School and theory are important, but don’t stop learning. Read books and research, listen to podcasts, connect with professional organizations and go to trainings and conferences to continue to learn and grow. Find colleagues who will support you and help improve your craft by staffing cases, challenging your perspectives and sharing successes and failures. Honor yourself by getting in touch with and listening to your inner voice. Tap into your fears and drives and physical body. We know when things don’t feel right; pay attention to that and find a different way or ask for help. When something is fulfilling, pay attention to that, too, and celebrate those moments. Don’t let doubters get in your way—let your haters be your motivators. Don’t spend too much time in the past or in the future; try to stay focused in the present, because it’s a gift. When you make mistakes, don’t judge yourself too harshly—there are enough critics out there; be kind and forgiving to yourself. Life will always bring another obstacle to overcome, and every time it will be hard and maybe painful, but that’s how we grow. It’s pointless to try to avoid hardship; the waves will keep coming, so you have to learn to surf. 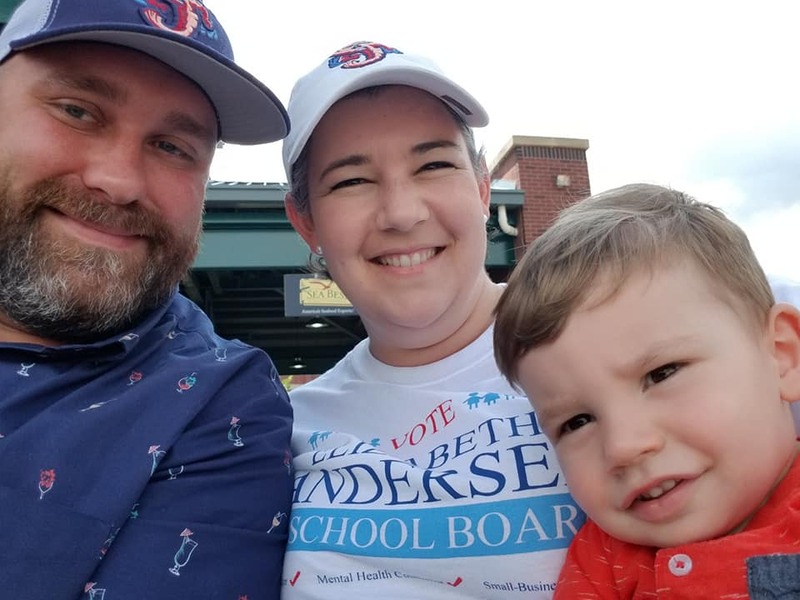 This interview is not an endorsement of Elizabeth Andersen, nor do we have intentions of endorsing candidates in any future local or national elections. However, we believe that the key to a successful democracy is an informed electorate. We encourage you to check out your local Supervisor of Elections to form your own educated decisions.